full of the meta, about ourselves as pirates and thieves, done with nods to many fandoms (and, of course, the more of them you understand, the better the vid); and in particular, ending with the clips from 'V for Vendetta', which speak about the power of the anonymous mass to dispense with tyranny. (Or at least, that's one message you can take from it). If you're not the fannish sort, I'd be interested to know what you make of it. Cross Posted at Cocktail Party Physcis. Lee Kottner here, on assignment from Jennifer to cover at least one of the offerings the World Science Festival held in NYC last weekend. Before I get started on the one event I actually got to, let me say how hard it was to narrow it down. So many cool offerings! So little time! It was just like being presented with with a really juicy conference program and having to pick between overlapping sessions: a nerd's paradise, with the bonus that there was also a street fair, movies, and art. Definitely more fun than your average conference (unless it's the Kalamazoo Mediaevalists). This is the World Science Festival's first year, so it's a little rough around the edges yet organizationally, but the line-up is absolutely stellar, and the intersections of art and science couldn't have been more intriguing. Theatre, dance, music, and film were all represented, along with the history of science and the fields of math (or maths, for you Brits out there), physics and astronomy, evolutionary biology, environmental science, epidemiology, genetics, botany, computer science, engineering, and neuroscience. The topics ranged from creativity, space-time, longevity, climate change, and astrophysics to the science of sports, of illusions, of green building and of Disney Imagineering, and plays and films about Einstein, Richard Feynman, Hugh Everett (of the parallel worlds theory) and . . . Jason Bourne. The movie opens with an unconscious figure in a wetsuit (Matt Damon) floating face-up in a stormy Mediterranean Sea. Hauled aboard a passing fishing vessel, Wetsuit Man is discovered (1) to be still alive, though (2) shot twice in the back and (3) to be carrying a stainless steel capsule embedded under the skin of his hip. The capsule contains a laser which projects the number of a blind Swiss bank account. Huh? Wetsuit Man comes to, understandably upset at having objects removed from his body without his consent (or anesthesia), even if they are bullets and weird implants, and discovers he doesn't know who he is. He can walk, talk, play chess, shuffle cards, do pull-ups, tie complicated knots, speak several languages and function on a day-to-day level, but he has no idea who he is or was, or where he's been for the last twenty-some years of his life. For all he knows, he's sprung from the sea like Venus on the half shell. Classic amnesia. Or at least the Hollywood version. Amnesia of just about any type is actually pretty rare, though you'd never know it from watching soap operas or reading Gothic murder mysteries. 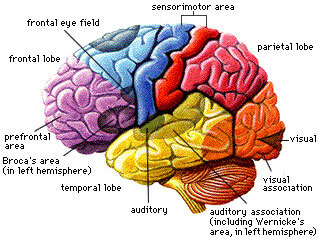 But there are several different types of amnesia and a number of causes. The two main types are anteretrograde amnesia, the inability learn and remember new information since the time the amnesia began, and the kind our hero experiences: retrograde amnesia, which involves a lack of memory of the past preceding the time one becomes conscious again. One of the symptoms of dementia is memory problems, but unlike those suffering from, say, Alzheimer's, victims of amnesia retain their cognitive powers and intelligence. They lack only their former memories, or, in the case of anteretrograde amnesia, the ability to make new memories. Guy Pearce's character suffers from this type of amnesia in the 2000 movie Memento, and must constantly write himself notes and take Polaroid pictures to tell himself what he's been doing for the past fifteen or so minutes. Amnesia can encompass varying stretches of memory—from all of your previous life (global amnesia, usually transient) to just the five minutes before you knocked yourself out in a bike accident—and last for varying periods of time. Its causes include stroke, inflammation (from infections like encephalitis), tumors, oxygen deprivation (from a heart attack or CO poisoning), long-term alcohol abuse, and the classic Hollywood cause: pressure from bleeding between the brain and skull, i.e., a knock on the head. It takes a fairly serious head injury, however, one likely involving a long coma and months of rehab, to induce anything but transient global amnesia. Wetsuit Man, who eventually decides his name is Jason Bourne on the strength of the evidence he finds in his lockbox at the Swiss bank, also discovers along the way that some of the things he knows how to do are downright scary. In one very subtle scene before Bourne visits his lockbox, he tries to catch some sleep on a park bench but is rousted by the Swiss cops. One pokes him with a nightstick, which Bourne grabs reflexively. If you watch carefully, you'll see him pause and in that pause is the moment when Bourne says to himself, much like Neo in The Matrix, "Hey! I know Jujitsu!" Bourne then handily disarms and disables the cops and runs away, to live to lay movie-fu on other attackers another day. Okay, he doesn't know who he is, but he can take out two trained cops in less than 30 seconds? Wait, it gets weirder! As the movie progresses, it's clear that Bourne is not just a martial artist with lightning reflexes (and that he fights dirty as hell), but he knows all about surveillance techniques, weapons, and being followed. Sitting in a truck stop on the way to Paris, he says to his new accomplice, Marie, "I can tell you the license plate numbers of all three cars out front. I can tell you that the waitress is left-handed and the guy at the counter weighs two-hundred and fifteen pounds and knows how to handle himself. I know that the best, first place to look for a gun is the cab of that grey truck outside. I know that at this altitude I can run flat out for half a mile before I lose my edge. I knew that you were my first, best option out of Zurich. How do I know all that? How can I know all that and not know who I am? How is that possible?" Excellent question, Mr. Bourne. Is this just another example of Hollywood mangling scientific truth? Well, no, it's not for a change, though I wouldn't have known it without going to this talk. James Schamus started it off by asking Dr. Tononi if this kind of amnesia was actually possible. Surprisingly, the answer is yes, but it is more likely if it has a specific cause. In Robert Ludlum's original book, it's the classic blow on the head that gives Bourne his case of amnesia. Liman, in his research before making the movie, discovered this was unlikely to cause the kind of amnesia Bourne suffered from. Liman twisted the plot a bit and, though Bourne does suffer a break of consciousness after he's shot and falls (is tossed?) overboard with two bullets in his back, his amnesia is purely psychological in nature, arising from an internal conflict. Psychogenic amnesia, it turns out, acts just like physically induced amnesia in many ways, but without the trauma. Dr. Tononi studies consciousness and its disorders, so this is right up his alley. True to the nature of the talk, he came prepared with a PowerPoint presentation, the first slide of which showed two PET scans of amnesiacs, one caused by encephalitis, one psychogenic. In both, the right temporal lobe (the yellow bit in the diagram at right) is inactive in almost exactly the same areas, though one brain is completely uninjured. Unsurprisingly, this is the part of the brain that is most closely involved with memory, mostly the storing (the hippocampus is thought to be mostly closely involved with making memory). Recent studies in brain mapping and neuroscience have shown that our brains generally parcel tasks into regions. Our memories are concentrated in one area; our skills, some of which involve muscle memory (proprioception) in another; our pattern recognition in another, and so on. Knowledge and personal memory are not the same thing, either. Our knowledge about a subject is static and factual, while personal memory tends to encompass a linear sense of time and other sensory impressions. Memory, like dreams and oddly like the movies, as Schamus pointed out, is a limnal state: ambiguous and untrustworthy as cops and prosecutors well know. We tend to think of our memories as fixed and visual. The research of Dr. Tononi and others has shown that consciousness is a process, not just a location, and that our memories are not representational but rely more on reconstruction than recall. There's no rewind or replay button in your head, in other words. When we ask ourselves "Who am I?" or "What happened?" we're not going to get a picture, but a narrative, a story. This story includes not just our memories, but who we tell ourselves we are—our interpretation of those memories. If there's a clash between who we think we are and our memory, guess what loses? Then we become our own unreliable narrator. In the case of Jason Bourne, as the other two sequels to this movie show, the internal conflict is between the kind of person Bourne thinks he is (one of the good guys who doesn't just randomly kill people) and the things his memory tells him he has done (not-so-randomly kill people). What sparks the conflict is a mission to assassinate a dictator in exile and finding him on his boat with his children in the same room. Bourne can't bring himself to shoot the man while he's holding his daughter and his other children are asleep in chairs around him. Instead of a blow to the head, guilt is the trauma, and Bourne conveniently forgets what he does for a living when he wakes up. It's too awful to contemplate otherwise. In effect, Bourne becomes the person he thinks he is. Tononi pointed out that people with dissociative disorders, including multiple personalities, don't share the memories, even on a PET scan, that their "others" have. People in dissociative fugues can suddenly forget who they are (usually because of some emotional trauma) and wander off. But unlike Bourne, they generally don't know they've lost something, and will assume another identity, not try to find their old one. This separation can also occur in sleep states, such as the infamous case of Kenneth Parks, who killed his mother-in-law and seriously injured his father-in-law when he was sleepwalking, but had no memory of it. Bourne is in the process of writing a new story for himself, reconciling what he did with who he is now, and in doing so, recovers the memories of who he was. Like Kenneth Parks, until he regains his full memory, Bourne is conscious but not self-conscious. Originally, this was a big problem for Liman, as a director. Usually, when characters are introduced in a story, the audience is cued on how to relate to them by seeing them in the context of their life: with friends, relatives, their dog, their boss. Bourne has no one and nothing to cue his audience. He's a blank slate. It's only in his journey, in the reconstruction of a new personality, that he becomes interesting and fully aware. Now, imagine not only having your past be a blank slate, but not being able to imagine a future. Tononi also mentioned the case of Clive Wearing, a British musicologist who developed total amnesia after a viral infection. Although he still knows how to play the piano and conduct music, he has no other personal memories and cannot form new ones, like the character in Memento. Only Wearing's memory is of even shorter duration than Guy Pearce's character. Wearing has none. Most of his waking time is spent "rebooting" his consciousness from moment to moment. His diary consists of the consecutive statements "I am alive! I'm awake now. I am alive!" If that's the entirety of one's self-consciousness, is there a self? Bourne, at least, does manage to find or make a new one, as well as recover his past. But not everyone does. Cue The Who. Oh wait. That's CSI. I forgot.